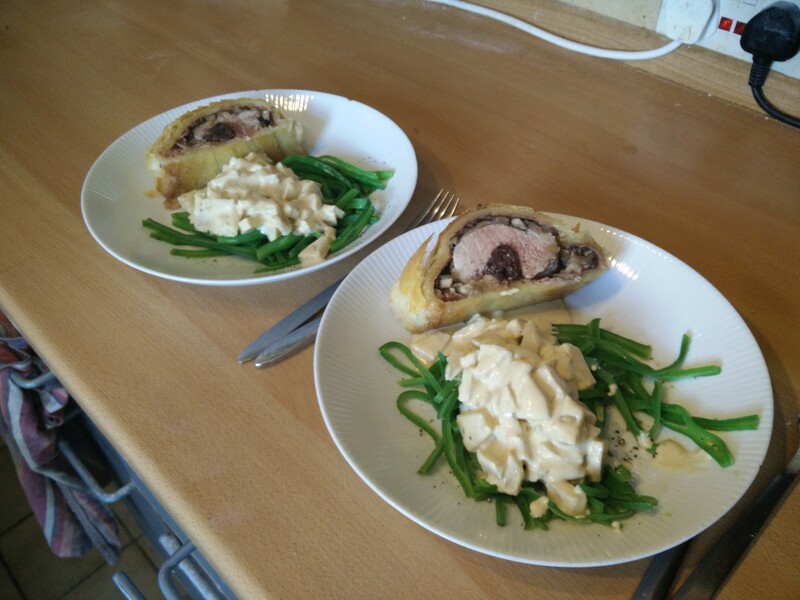 Last weekend we watched a Hair Bikers episode where they make a pork Wellington with a black pudding centre! 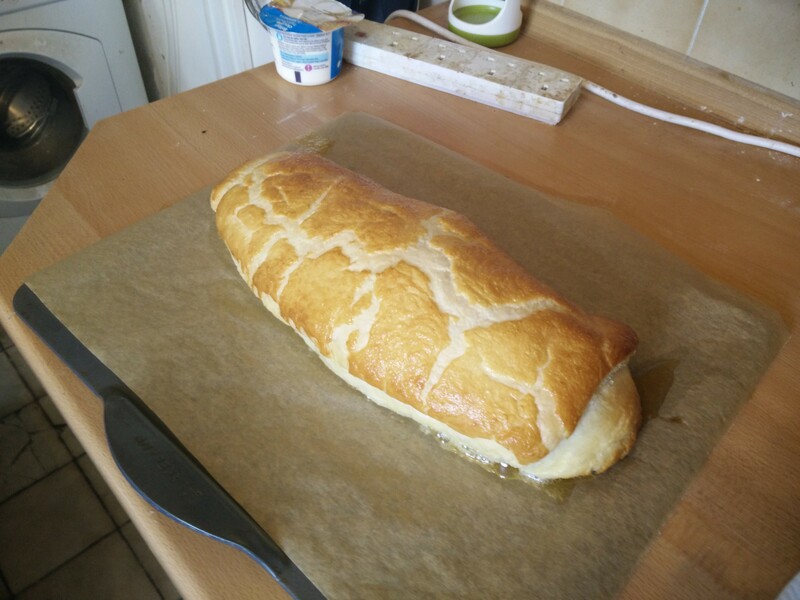 So Soph tracked down the recipe and we’re having it for Sunday lunch this week. 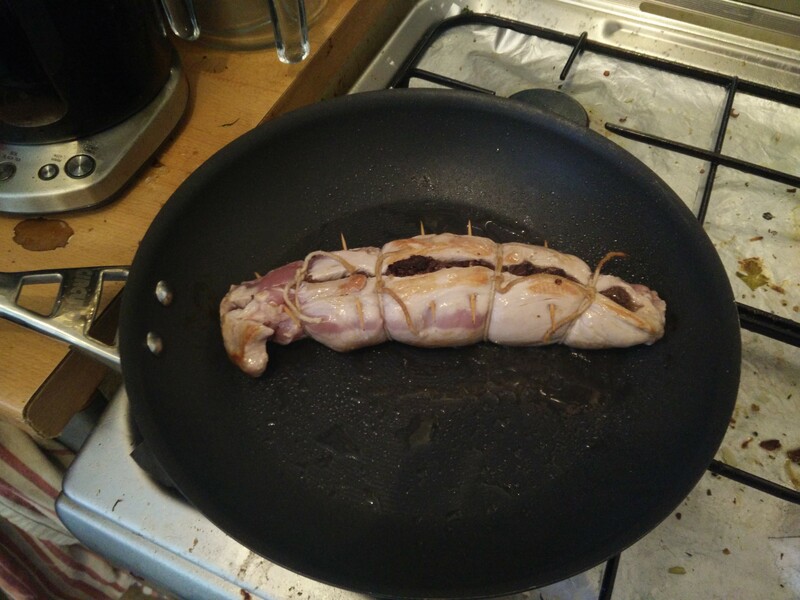 So we start with a pork fillet that gets stuffed with black pudding. The recipe wasn’t clear on how you’re supposed to sear it off once it’s been opened and stuffed, so we tied and pinned it up, which meant some bits didn’t get seared. 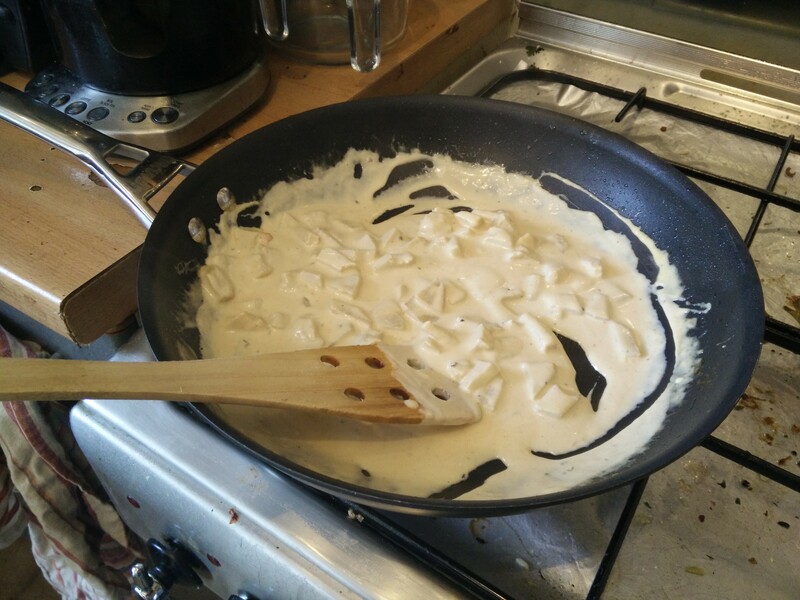 But that’s OK because we know we’re not ‘sealing in the juices’ we’re just getting some colour on the meat. 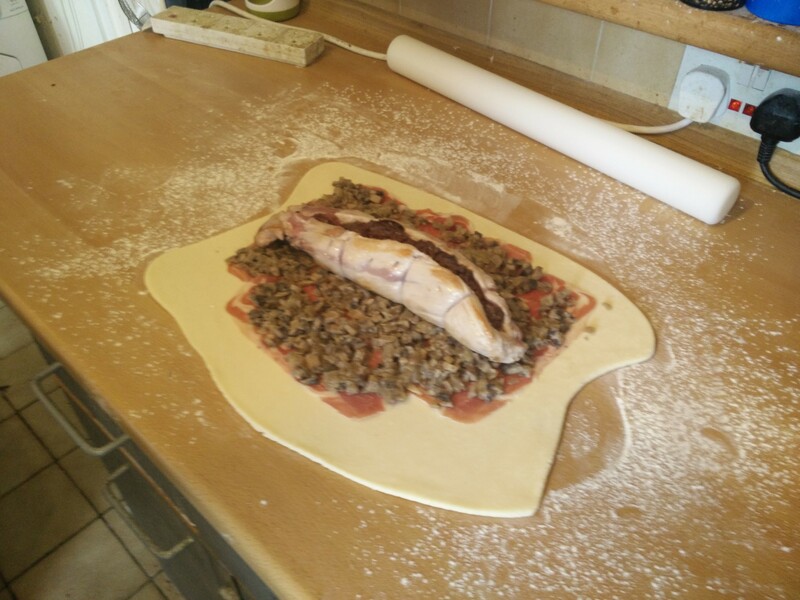 Then homemade puff, parma ham, and a mushroom & onion mix get layered up and the seared fillet popped on top. 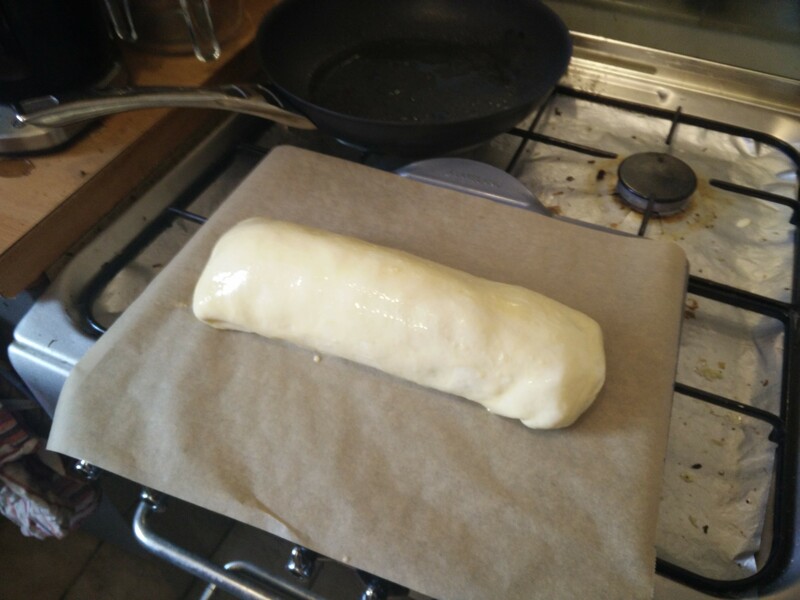 Then roll it up and egg wash.
Then bake for 15mins at 180C fan, then start to question the temperatures given in the recipe… were they already fan? It wasn’t clear. So do the next 10mins also at 180C fan. Then still not be convinced things are right and what up to 200C fan for another 10mins, and finally things are looking right. While we were baking that we made, with various breaks due to the confusion over cooking time, an apple sauce. 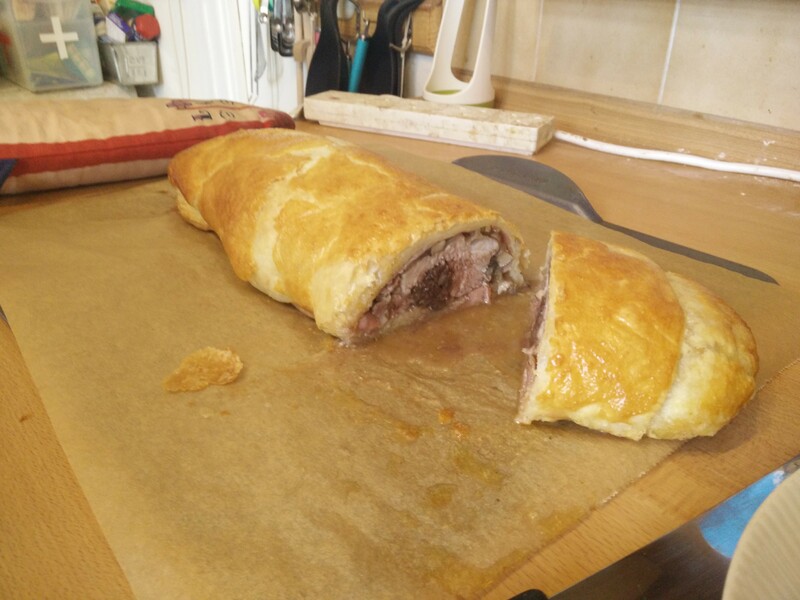 Once the Wellington had a chance to rest it was time to open it up and check that it was cooked inside too. Yep – all good in there! So plate up with some green beans. Mmm as delicious as we’d expected it would be after seeing it on the telly! Plus there’s plenty of leftovers for dinner!